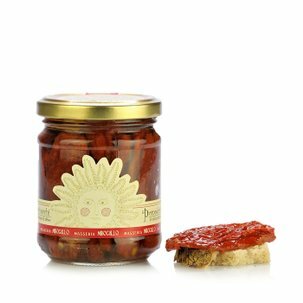 The dried peppers from Masseria Mirogallo are selected and dried naturally without the addition of preservatives or colourants: this is the only way to fully enjoy the typical flavour of the sweet red pepper. Delicious and versatile, they are light and crispy. Their flavour is the natural flavour of peppers that makes you think of summer. The dry peppers are traditionally used to prepare the so-called peperoni cruschi, which are chunks of dry peppers pan fried in olive oil, a typical Lucania dish. 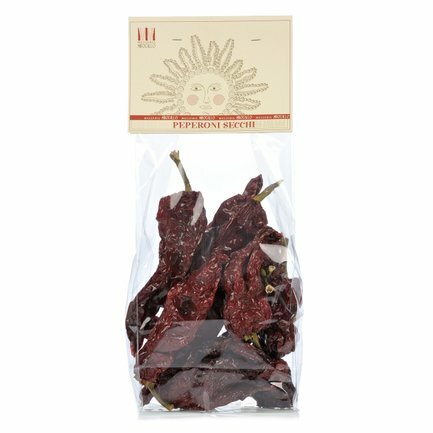 When cooked in this way, these peppers can be served as an appetiser or as a side-dish for roasted meats or salt cod. 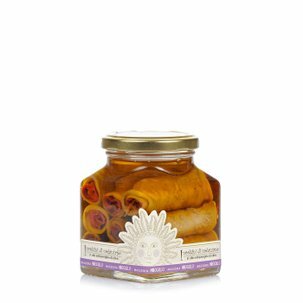 On their own, they can be used for your aperitifs or you can crush them to give your pasta or risotto a touch of flavour and colour. Ingredients Dried peppers For more information on product labels, please contact our Customer Service department. The information on the labels of the products may vary for reasons beyond our control, therefore, there may be discrepancies between the information on the site and that on the products delivered. Please always check the information on the product before consumption or use.